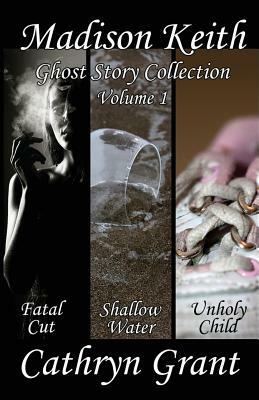 This collection includes the first three novellas in the Madison Keith Suburban Noir Ghost Story series: Fatal Cut, Shallow Water, Unholy Child. In Fatal Cut, a man is brutally murdered in the church parking lot. Madison Keith is the only one who isn't surprised by the identity of the killer. She has witnessed first hand the buried resentments and bitter hearts of the people at her new job, not to mention the appearance of those who have passed on. In the second novella, Shallow Water, Madison finds a dead body in the shallow water of Half Moon Bay. The most likely culprit has a rock-solid alibi, and Madison isn't sure whether the legendary ghost that haunts The Distillery restaurant is helping or hindering her quest to understand why a young woman drowned. When Madison agrees to meet a good-looking bartender on the beach, ghosts and corpses take a back seat. In the third novella, Unholy Child, a proposed child care center enflames hidden prejudices at Central Avenue Church, leading to murder. A dark spirit terrifies Madison and dampens her previous enthusiasm for encountering ghosts. She's determined to find out what, or who, is causing her torment. The answer is unsettling. Madison forgets all about sinister ghosts during a romantic dinner with the cute bartender she met in Half Moon Bay. Both the living and the dead like to reveal their secrets to Madison Keith. As the administrative assistant in the basement office of a suburban church, she gets plenty of opportunity to hear from both. Through it all, Madison offers up a steady stream of opinions on everything from the subject of religion and ghosts to finding a soul mate.